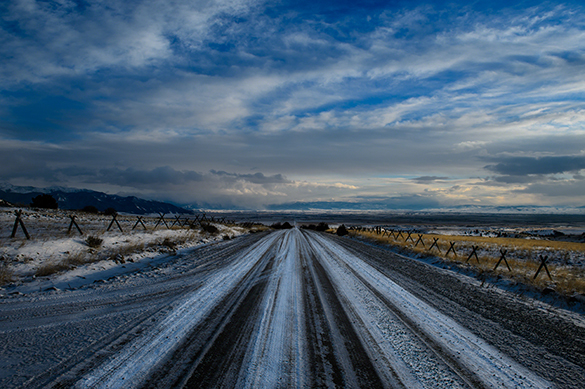 I’ve always been an advocate for using man made roads or any other form of roadways when photographing landscapes. Like any other photograph there has to be a way for your eye to move through the image. While this can be done with many tools, using a road is certainly one of the most obvious. Sometimes the most compelling landscape images are nothing but a windy road, while other times it’s just a lead in. Roads are not just part of the story but they can lead the imagination some other place. What lays at the end? How far does the road go? What’s down the other end? Shooting with the D4 and 24-70 AF-S f/2.8, I tried to capture the beauty of a simple road leading down into the valley during sunset. With a little help in Adobe Camera Raw, highlighting certain areas along the pathway of the road, the eye has a place to go and a story unfolds.